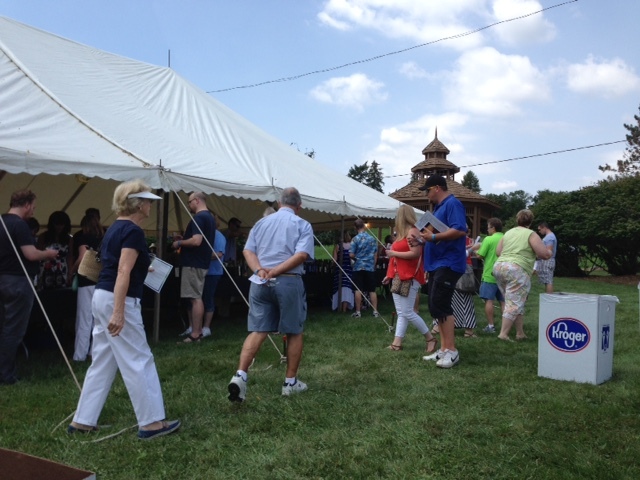 Picture perfect weather and a gorgeous location among the lawns and gardens of the Meadowbrook Music Festival north of Detroit, the 2015 Meadowbrook Wine and Food Festival didn’t disappoint… at least not with the wines. With five large tents housing more than 150 wines from 18 regions and featuring 9 Michigan wineries there was something for everyone. I spent my drink tickets principally on the Michigan wines. As expected I found a few that were sweeter than I prefer but on the whole Michigan made a strong showing. Established shortly after the repeal of Prohibition, St. Julian is one of Michigan’s oldest and most well-known wineries. The Late Harvest Riesling is a sweet wine yet crisp and very approachable even for those, like me, who prefer dryer table wines. The wine is smooth on the palate with notes of peach and honey. The most “local” of the local wineries pouring at the festival, Fieldstone is located in downtown Rochester Hills, about 30 minutes north of Detroit and a few miles from the festival site. A local winery in that they make their wines here in southeast Michigan, Fieldstone sources their grapes from “all over,” including bringing the syrah in from California. A new line, the Motor City Red is lovely: soft, dry and medium-bodied, with notes of black cherry and a pleasant minerally finish. Locapour purists will argue this doesn’t classify as a local wine, and I agree. But with results like this I’m more than happy to support local winemakers. A Cabernet Sauvignon/Merlot blend, this wine has nice notes of dark berries without being overly jammy. Full-bodied with medium tannins, the wine has a nice, slightly “dusty” finish. I am a sucker for a good ice wine, and Warner’s didn’t disappoint. The wine had a silky, rather than satiny, mouth feel and lovely notes of pear and honeysuckle. Located in the northwest corner of the Lower Peninsula, not far from Traverse City, Bel Lago grows a number of cool climate grapes including Pinot Noir, Pinot Grigio, Chardonnay, Riesling and Gewurztraminer. Their Pinot Noir was my choice for pairing with lunch. Smooth, with soft notes of raspberry and cherry, medium-tannins, and a nice finish. 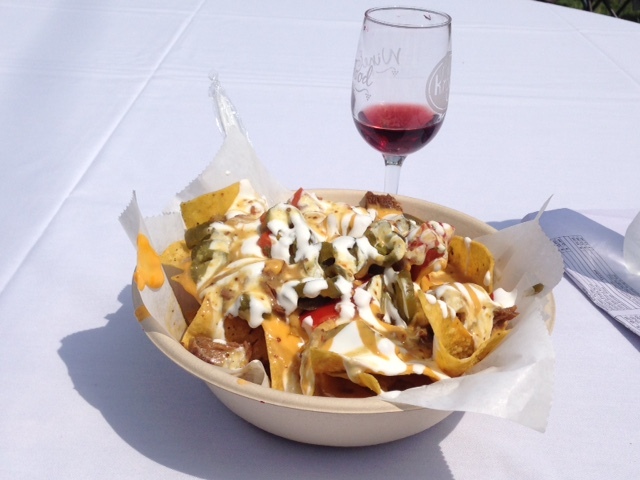 The wine held up well against the beef brisket BBQ nachos I had for lunch, balancing the smoky sweetness of the BBQ sauce. 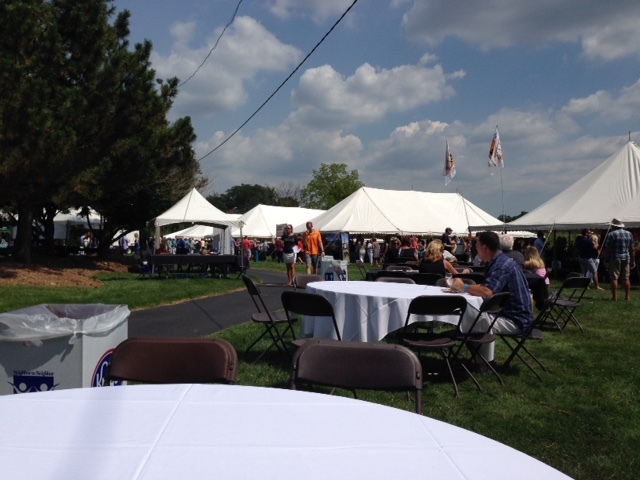 And speaking of food, for a festival advertised as a “Wine and Food Festival,” the food options were very slim. Kroger, the largest grocery chain in Michigan and a sponsor of the event, had a large tent at the entrance to the event featuring a sampling of standard grocery-store deli fare: Boar’s Head turkey or ham sandwiches, cheese and coleslaw. There were two food trucks: The Pistons Maplewood BBQ and Chick-A-Dee. The Maplewood BBQ beef brisket nachos were very good, but there’s no question this is NOT a food festival. I started my day with the Seven Lakes Capriccio, and at the end of the day this remained my favorite of all the wines sampled. Nice nose with light notes of cherry blossoms. In the mouth, the wine is juicy rather than jammy with bright notes of cherry. The finish has a very light pepper which balances the fruitiness, yielding a very nice wine. Looking forward to opening the bottle I brought home. I finished out the afternoon with samples of two grapes I had come to love during my time exploring Connecticut Wineries. Seven Lakes’ Cab Franc was surprisingly earthy – surprising to me who had grown so accustomed to the very fruit-forward cherry I found in Connecticut Cab Francs. Full-bodied with lovely notes of grass and well-balanced tannins and a smooth finish. Dizzy Daisy’s Marechal Foch, like the Cab Franc which I sampled shortly afterward, came as a surprise – in this case a shock… it was sweet! I had my first encounter with Marechal Foch almost seven years ago when I first started traveling the CT Wine Trail. Finding the grape to come across as very young and green, it took me quite a few samplings before I came to appreciate it, and even longer before I became a fan. Like so many other CT reds it was very fruit forward, but it was always a dry wine. As a semi-sweet wine, the fruit notes were much stronger and also smoother than in other Marechal Foch’s I’ve tried. The additional sugars balanced out the “greenness” I often detected, and as a result I suspect Dizzy Daisy’s is more approachable to a majority of wine drinkers. But as my preference leans towards dry wines, I found this to be less interesting. It’s hard to glean a lot about wines and winemakers from 1 oz samples, especially when you are sampling across a range of wineries. With people lined up behind you, there’s not much time to chat. But as a small introduction to the wines of my new home state it was a great afternoon. Yes, I have a lot of material from places that I have already been, but I have a little ADD. I sometimes, just need to move on to a new topic and this is one that I am pleased to get to… as it is about local wine. It is my home state of Illinois’ neighbor to the east, Michigan. Michigan has been producing wine from local wine grapes since the late 1600s. Yes, 1600s. Currently the 2,000 acres of wine grapes planted in Michigan are a mixture of American (vitis labrusca), Eurasian (vitis vinifera) and hybrid varietals. Michigan is home to over 100 wineries and four viticulture areas: Fennville, Lake Michigan Shore, Leelanau Peninsula and Old Mission Peninsula. Michigan is famous for its fruit wines, ice wines and also for their sparkling wines that have made the wine lists of some of the best restaurants (Charlie Trotter, The Girl and the Goat to name a few). So let’s begin our exploration of Michigan wine! As always, if you have a favorite, please let me know (and Marguerite too). So after all that discussion of the Ohio and the Firelands, did I finally get around to tasting any wine? Of course I did! I began with the Pinot Grigio, currently the most popular wine according to the ladies in the tasting room. I could taste green apple and grass. It was a little less crisp than some of the pinot grigios than I have had in the past, but this is a good thing… Sometimes, those wines get too bitey and for some reason that makes the hinge of my jaw hurt. (I never said that logic was my strong suit). Next up was the Riesling. This was advertised as tasting of apples but I thought it had more of a honeyed flavor that reminded me of pears. This is made in what I consider a more traditional style, in that it was semi-sweet. I love the new modern dry Rieslings as well, but there is something to be said for the full, fruity and floral tones of the traditional method. I even sampled the Gewurztraminer which I had tasted with Henry Bishop, Rory and Kevin (albeit not the same vintage). It is still an excellent blend of tropical fruits and rose petals. The best of two different worlds. Additionally, I tasted both the Pinot Noir (a wine that I have enjoyed from Great Lakes regions, i.e., Niagara Escarpment) and the Cabernet Franc. The Cabernet was herbal and lightly spicy and nicely dry. The Pinot Noir was smoke with anise and cherry. Additional wines from the other Lonz, Inc. labels were available including the Mantey, Dover, Mon Ami and Lonz (from grapes produced on Middle Bass Island). I picked up a Mantey Cream Sherry for my father. He has always been a fan of Ohio sherries and am looking forward to tasting it with it in the near future (most likely Thanksgiving). Additionally, the winery is a source for homewine makers and sells juice in the autumn (until it runs out). Continued from Thursday, September 17, 2009. Both Maree and I prefer reds, so we carefully coordinated our selections to ensure we got to try as many of them as possible. Under the Alba Vineyards label, the winery produces three reds: Old Mill Red, Chambourcin, and a Pinot Noir. Unfortunately the Chambourcin was temporarily out of stock, so we each selected one of the other two. Old Mill Red Described as a “chianti-style” wine, this is a very drinkable, pleasant red table wine. Made from a blend of Marechal Foch and Chambourcin, with a bit of Merlot and Cabernet Franc thrown in, the wine is aged in american oak for 8-10 months. The nose is rich with strong notes of dark berries and plum. In the mouth there are also discernible notes of plum, and the oak provides a smoky finish. I felt the wine would definitely benefit if allowed to breathe, as it was there was a sharpness in the mouth that is often found in wines with a strong percentage of Marechal Foch, and that usually mellows when allowed to breathe for 30 minutes or so. 2004 Pinot Noir The vineyard has only recently planted Pinot Noir grapes, and this is one of Alba’s first pressings. For the 2004 vintage, the grapes came primarily from the New York Finger Lakes area and the Williamette Valley in Oregon. The wine is a medium-bodied wine, although on the lighter side of medium. There are lovely notes of cherry both in the nose and in the mouth, and there’s an interesting tanginess at the end. This struck me as a young wine, and I wasn’t surprised to find that Alba has only just begun working in Pinot Noir. For a newer wine, it is interesting, though, and I believe future vintages will grow richer and more complex. Next we proceeded to the Cabernet Sauvignon and Syrah of Chelsea Cellars. 2003 Cabernet Sauvignon This was a lovely, very drinkable wine. Medium-bodied with a soft dark-plum nose, the wine is rich and soft in the mouth. On the palate the notes of plum are nicely balanced by touches of pepper and spice. This would pair well with a wide variety of foods and should age well. Definitely one of my favorites of the afternoon. 2005 Syrah I’ve been gravitating towards Cabernet Franc and Syrah lately, and the Chelsea Cellars Syrah didn’t disappoint. The color is a dark red/purple – almost plum color. The nose is smooth and light with notes of both cherry and plum. Medium-bodied, in the mouth the wine has definite notes of plum and light notes of cherry which give it a brightness and freshness. The finish is smooth with a nice balance of acid. While I did like this wine, I definitely preferred the Cabernet, finding it a more interesting and complex wine. We finished up the tasting with selections from among the Dessert wines. Maree, who loves blueberries and had never tried blueberry wine, gave that one a whirl. I, who have been tasting a fair amount of fruit wines lately, went with the Dolcina, an ice-wine style dessert wine. Blueberry Wine When they say blueberry, they aren’t kidding. The smell and taste of blueberry is predominant in both the nose and mouth. Interestingly, though, it’s not overwhelming. Like their Apple and Raspberry wines, Alba’s Blueberry wine is sweetened solely from the fruit and the result is a flavor that comes very close to blueberries straight from the vine. It’s a rich, deep flavor that evokes … summer. This will pair exceptionally well with chocolate or cheesecake as well as with fruit and cheese. It would also be good sipped on it’s own as an aperitif. Winner of the 2009 Governor’s Cup for Best Dessert wine. Dolcina Described as an “ice-wine” style, the grapes are harvested late in the season (but not technically late-harvest) and cyrogenically frozen to produce that rich, velvety sweetness that one finds in ice wines. The nose has notes of honey and apricot, and the mouth feel is soft and smooth. In the mouth, the notes apricot and honey blend harmoniously, with neither one being predominant. Definitely a nice dessert wine, but I found it didn’t have the depth and character of the true Ice Wines of the Niagara region or Germany. The normal tasting menu at Hopkins includes one sweet wine, the Night Owl Vidal Blanc. However for an additional $2.50 you can also include a tasting of the Ice Wine. Because Hopkins only has two wines in this category, I normally would have grouped these with the Semi-Sweet wines and covered both categories in one post. However, both Christy and I agreed, hands-down these are the two best wines at Hopkins, and as such deserve their own post. Night Owl 2007 Vidal Blanc Estate Bottled This is a Late Harvest dessert wine. Late Harvest refers to grapes that have been left on the vine longer than normal, being allowed to dehydrate on the vine. The result is a grape with more concentrated sugars, thus producing sweeter wines. The Night Owl is a smooth, full-bodied wine that dances across the tongue. The nose is mellow with hints of apricot, and the wine itself has subtle notes of apricot and hazelnut. It would pair nicely with a fruit and cheese platter, light desserts, or even serve as the finish to a meal all by itself. Ice Wine 2006 Estate Bottled Also made from Vidal Blanc grapes, Ice Wine differs from Late Harvest in that the grapes are allowed to freeze on the vine before harvesting, and harvesting is usually done at night or in the very early morning to ensure the grapes remain frozen. On the day Christy and I stopped by they were getting ready to harvest this year’s crop of Ice Wine grapes starting at 4:00 am the next morning. Hopkins’s Ice Wine is hands-down my favorite wine not just from Hopkins but on the wine trail to date. The bouquet is gorgeous, rich, fruity, decadent… The color is a lovely golden yellow, and, to borrow a phrase from the tasting notes, the wine is “fantastically sweet.” This wine just melts in your mouth. It is a beautiful blend of fruit with just a touch of honey. Absolutely gorgeous. Since first being introduced to Ice Wine a number of years ago during a wine trip to the Niagara region in Canada, I’ve been a big fan. However, not many wine stores carry Ice Wine, and those that do often have a limited selection. I’ve tried those Ice Wines that I could find with mixed results – all are sweet, but not all have the same body and depth – and in general, have found that I greatly preferred those from the Niagara region. That is, until Hopkins… In my opinion, Hopkins’s Ice Wine can hold its own against any of the Niagara wines any day. Even if you’re not a fan of sweet wines, if you do get to New Preston, CT, don’t pass up the Hopkins Late Harvest or Ice Wine – those two alone are worth the trip!